Barely a couple of hours from Pune, Anjee's Chalet at Karjat is a spectacular homestay that looks nothing short of a gorgeous wooden chalet on a Swiss postcard. Nestled atop a hill, against a backdrop of misty mountains, blue skies and meandering rivers, Anjee's Chalet looks like a dream. It's the kind of luxury homestay you book on your big day, perhaps a milestone in your relationship. We love how the decor of the chalet compliments the surroundings outside. Plush wooden interiors for the rustic look, glassy windows and doors for plenty of natural light, pastels and soft notes for a relaxed setting and a romantic bedroom with a balcony that overlooks the vast, green lands. We hear there is a private sit-out area too where you can spend the day playing carom with your partner or just indulging yourself in a good book. 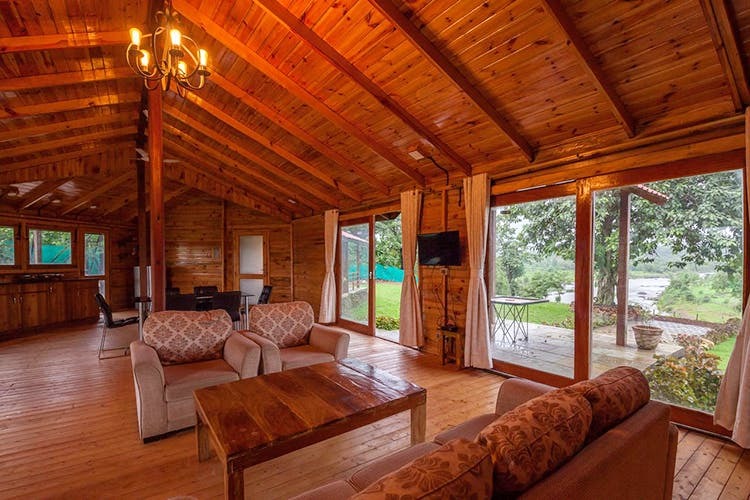 Anjee's chalet is spacious enough to accommodate about 14 people in its three bedrooms. The prices are slightly steep, starting at INR 15,000 per night for the entire villa. However, considering its location and features, we don't mind spending our money on it. Anjee's Chalet is close to a number of tourist sights like Bhimshankar Hills, Kondane Caves, farmer's market and more. Make sure you check these out.